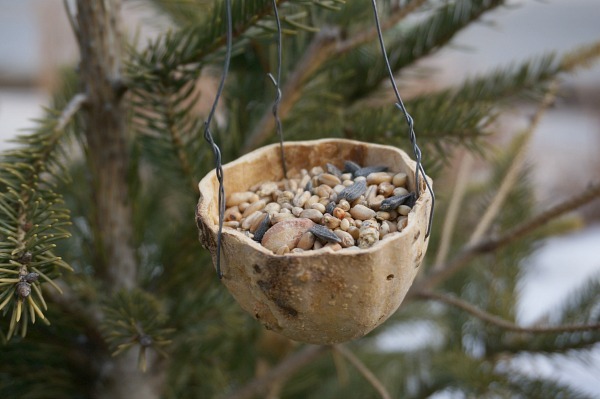 For a couple of years now I have been wanting to make a bird feeder out of a gourd. My best friend gave me a large gourd birdfeeder for my birthday a few years ago. Ever since then I have been wondering if we could do the same thing, on a smaller scale. So, last fall when we were putting away the fall decorations I kept aside all of our little gourds. I kept 4 gourds and in the end 3 of the gourds could not be used because they became soft and mouldy. However, 2 of the gourds dried nicely and were perfect candidates for turning into bird feeders. 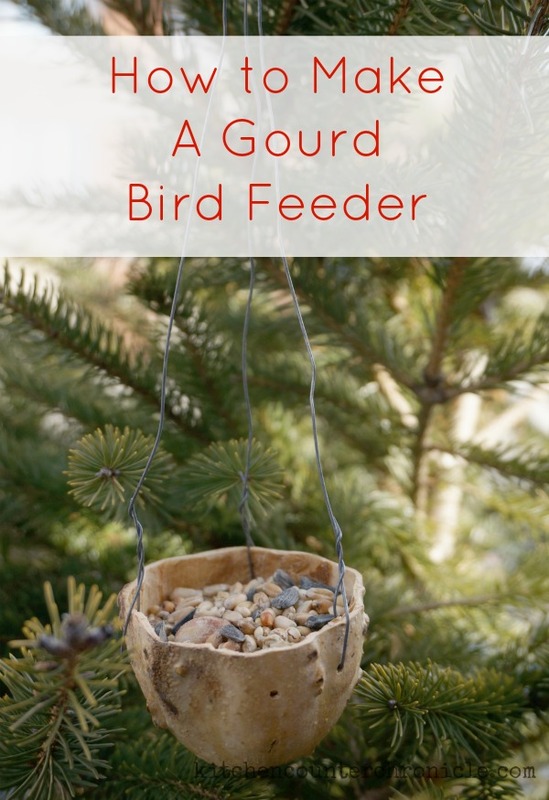 Our next step was to figure out how to make a gourd bird feeder. The first step is allowing the gourd to dry. Place the gourd in a dry spot and after a month give it a shake. When the gourd feels light and you can hear the seeds rattling around inside, the gourd is ready. It might take a few months…patience. Next, I used a bread knife to cut the gourd in half. 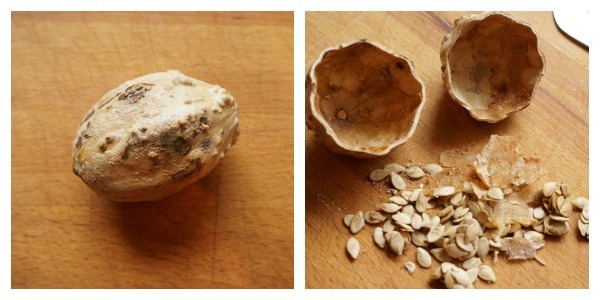 Once the gourd was cut in half, we could see that the inside was hollow…the seeds were perfectly dried. Seriously, it was pretty cool to see. 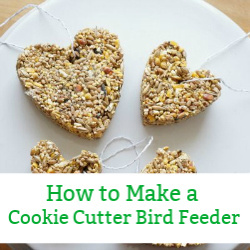 We cleaned out the seeds and used a fine drill bit to make the holes we would use for hanging the bird feeder. I positioned 3 holes evenly spaced around the gourd. Then I fed 3 pieces of thin wire through each hole. I simply twisted the wire to fasten it to the gourd. Once the wires were attached to the gourd, I brought all the wires together and created the hanger. 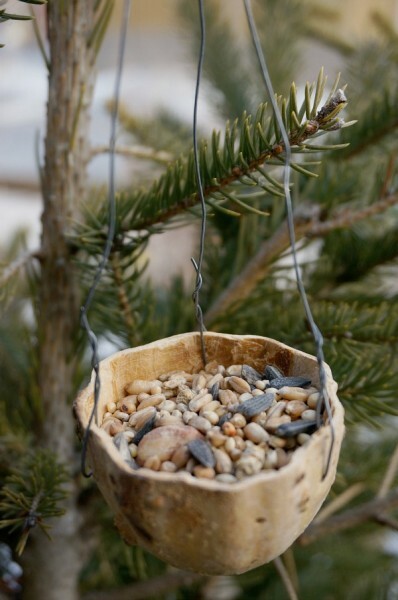 Finally, we filled the gourd with bird seed and hung them up in our little pine tree. Now we wait to see who will enjoy our little bird feeders. So, this project took some patience and some work with some tools…but in the end we created something really useful. 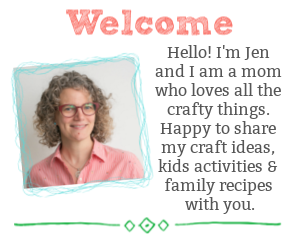 The last Outdoor Play Party was filled with fun posts, here are a few of my favourite posts. 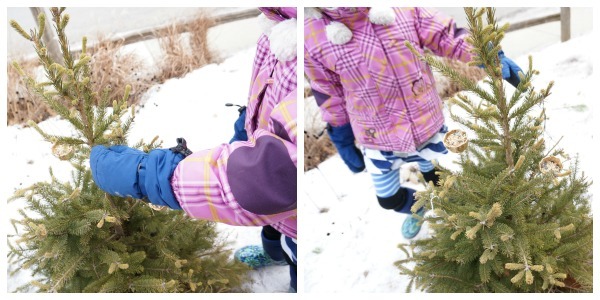 Little Wonders Days shared great winter activities when there isn’t any snow around. Rain or Shine Mama gives plenty of great tips for getting kids outside, even on the coldest days. Go fossil hunting with Kids in the Garden. 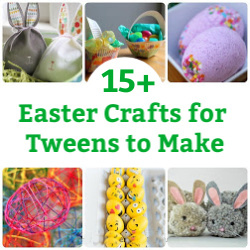 This one you do have to plan ahead for…next year. Thanks for stopping by Linda. I love this idea, one to plan ahead though but how effective it looks! This is great! 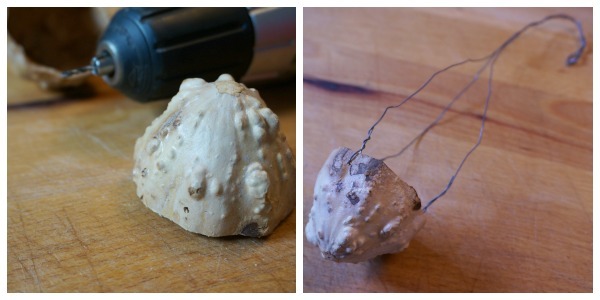 I was trying to work with gourds last fall but got a little stumped when mine well….molded. This project renews my interest in working with them! Try and dry a few of them. If they have a blemish, they tend to mold…but, you might just end up with a couple that dry completely. These are gorgeous Jen. I honestly don’t think I’ve ever seen gourds in the shops here! !